They can be as small as a length of a finger and weigh as little as a penny. Their wings flap 50 times per second, and their metabolism is so fast that they eat half their weight in sugar every day. They were revered in some cultures. Aztecs, for instance, believed that fallen warriors would return to Earth as these creatures. 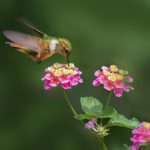 They are hummingbirds, and this is an overview on what they eat, how they eat, and how you can bring them to your yard. Hummingbirds are New World birds, in that they reside solely in the the Americas. They live as far north as southern Alaska and as far south as Tierra del Fuego, the southern-most tip of South America. The majority inhabit the more temperate climate of Central America, with other species migrating there during the onset of winter in the different hemispheres. They are known for certain distinctive traits and they have a pronounced bill that is slender and can be used to eat and to chase off competition at the same time. Their bill is a handy bit of evolution for hummingbirds, as it remarks on their food source and why they’ve spread throughout the Americas when other species have disappeared. One of my favorite birds is the Blue Jay. I just love their deep blue color, especially when I can get picture of them with deep green grass or bright white snow in the background. So what is a blue jay? 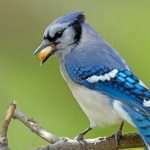 The blue jay is a partially migratory songbird in the Corvid family, along with ravens and crows. It has black and blue plumage, a white face and a thick bill. Those who have spent time or live in central or eastern North America tend to recognize them easily. They are mostly often remembered for that bright blue color, as there aren’t a wealth of boldly colored birds in this part of the world. Believe it or not, dragonflies are an exceptional means in which to get rid of those bugs that keep bugging you. 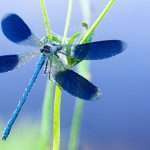 However, experts believe that 15% of North America’s dragonflies are in danger of extinction. So how do you help a bug that that helps you? Simple. You learn a little about them to determine what they eat and how to keep them safe. Start with a little dragonfly trivia. The term dragon-fly was first put into use in 1626 in a published work by Francis Bacon. Prior to that title, dragonflies had a vast array of names which included: adder bolt, snake doctor, and horse stinger. That last label was quite misleading, as dragonflies do not bite or sting. And that’s true, unless of course they are feeding, at which point they use their strong mandibles to chew on their prey.